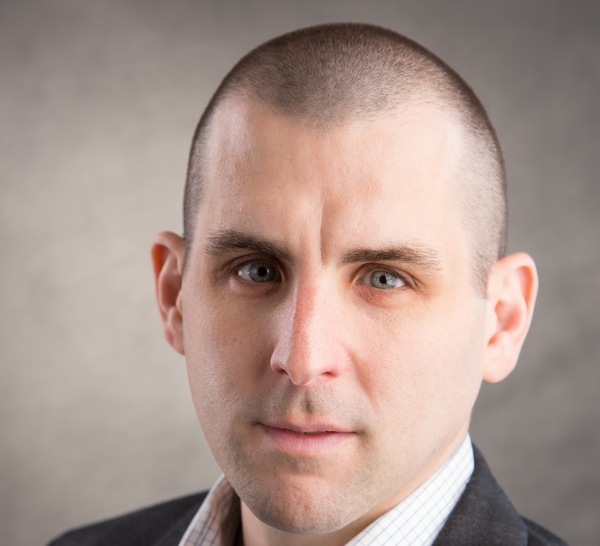 Scott Berkun is the author of four previous books and a sought-after speaker. His work has appeared in The New York Times , The Washington Post , Forbes , The Wall Street Journal , The Economist , The Guardian , Wired magazine, National Public Radio , and The Huffington Post . From 2010 to 2012 Scott led Team Social at Automattic. The Year Without Pants: WordPress.com and the future of work recounts his experiences and reflections on leading a distributed team at Automattic. We recently got the chance to ask Scott a few questions about the book and his time at Automattic. 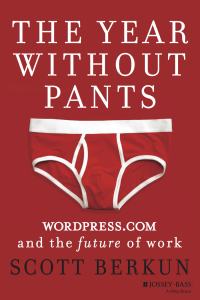 Give us a little insight into the title of the book, The Year Without Pants: WordPress.com and the future of work. What does being pantsless, or pants-free have to do with the future of work? Scott Berkun: A recent Gallup Poll showed 71% of workers are not engaged in their jobs: it’s a disaster! The book is a wake-up call to the business world and the title reflects that. There has never been any evidence dress codes or nine-to-five hours make people smarter or more productive, yet most workplaces demand these rules: why? The book uses my first-hand experience at WordPress.com to challenge what’s broken in the working world and how to change it. In Chapter 4, you say, “A great fallacy born from the failure to study culture is the assumption that you can take a practice from one culture and simply jam it into another and expect similar results.” What are the hallmarks of culture that could allow a company to flourish with a distributed workforce? Berkun: Trust. It’s a five-letter word but you won’t find much trust in most workplaces, which explains that 71% number. I’m certain the 29% of people who are passionate about their work have bosses who trust them enough as adults to decide for themselves how best to be productive. In Chapter 4, you cite transparency, meritocracy, and longevity as three principles of WordPress’ development as an open source project. How do these principles apply to the culture of Automattic today? Berkun: Automattic rarely uses email, which means most communication is visible to all, not locked away in email inboxes. Because most employees can launch updates to WordPress.com whenever they wish, launches are frequent and people can see who is productive and who isn’t. And since (Matt) Mullenweg and (Toni) Schneider constantly favor the long term in their decisions, there’s rarely stupid, demoralizing, short-term firedrills. Of all the things you learned about Automattic, what are the three most important lessons companies can take away from how we work? Berkun: The single most important lesson is you have to dig deeper to be good. For everyone reading this: you and you coworkers are probably in that 71%. Cherry picking tips and tricks — as managers are prone to want to do — will fail if it’s not paired with creating a culture that can support them. To replicate Automattic’s success demands going deeper into the story of how they hire, how their values impact their choices, and how they use (or don’t use) tools and understand the culture intimately. Only then can people see the steps needed to improve things where they work. As a manager, you’re experienced in traditional, in-person software creation teams. What was the most important thing you learned from your experience working as part of Automattic’s distributed workforce? What surprised you? If you ran Automattic, what would you change? Berkun: I’d make sure all my WordPress blogs got more traffic. Just kidding. As the book explains through my own success and failures while working at Automattic, I’d think about how to encourage people to make bigger bets and do bigger experiments. What’s next for Scott Berkun? Berkun: Right now, after three years working on this book, I have months of promotion of the book ahead! Writing books is hard but spreading the word about books is even harder. But I’m convinced everyone with a job will find the book, and Automattic’s story, fascinating and useful in thinking about how to change work for the better. I’ll be on book tour in Seattle, NYC, Boston, and other cities. Intrigued by the future of work? Want to become a part of it? Automattic is hiring. We want people who are willing to work hard, share their ideas, learn from their colleagues, take initiative to get things done without being told, and those who aren’t afraid to ask questions. Think you fit the bill? Toss your hat in the ring to work with us. Clever pun that works well even for us Brits who know pants are underwear. I was amazed by the cover and assumed Scott was addressing a real taboo – but I guess you can work in your dressing gown creatively with whatever kamakazee clothing absence beneath. I loved the trailer video, totally agree with the idea (uusally perhaps?) so look forward to finding out my own copy and seeing what evidence the author produces that informality and fun also aid productivity. Good luck to you. Love it, the whole concept. I’ve recently left 9-5 and MERCY ME I was so jammed in it. Looking for working now though! I appreciate he spent 3 years writing the book as on my blog I’m writing chapter by chapter a novel & I’ve been at it two years & now thinking it’s going nowhere as taking so long. So 3 years is normal… thank you. I love the wake up call. We all need it. Cannot wait to access the book! Thanks for writing it! This sounds like a book that everyone in business should read. I can’t wait to read it. Scott Berkun has written a brilliant insider account of the insights he gained from his time working for Automattic/WordPress.com. He shares the lessons he learned about the future of work and how the culture of work most of us know must innovate and get things done or perish. Most of us are familiar with work cultures that are not always transparent, flexible or focused on providing clarity and building trust. Some of us work in environments that claim to encourage X but reward and promote Y. If you want to spend less time in meetings and more time doing the hard work that builds companies, I’d encourage you to read Scott’s book. It is as entertaining as it is informative. You won’t be disappointed. Scott was one of our original blog guides/leaders when the Post a Day Challenge was launched in 2011. He helped many bloggers find their way and develop their craft. He has written and published several other books. I enjoyed reading this book and I know you will too. How many of us truly hold the intention to practice this in this quick-fix world we live in? The world expects. nay demands instant results and the way to achieve that is significantly different from a holistic optimisation approach. How does one achieve a balance here? Thanks for the mention of 9-to-5: “There has never been any evidence dress codes or nine-to-five hours make people smarter or more productive, …” Those of us with circadian rhythm and other sleep disorders need time-flexibility whether working remotely or in-the-office. At first, the title of the book; The Year Without Pants sounds very weird for me. However, when I read deeply, now I know that Automattic is very important meaning which is I supposed to work another fields. In short, we should shows great courage and determination to enjoy our work. And the lesson in this article is to make better communicate and be related to co-workers. serves as a good insight on the book! There are a lot of truths in this article. is it really possible to change after reading a book thought? Interesting sounding book about the workforce and the leadership that goes on. Anyone can be given a title “Manager” and be expected to lead… But do they REALLY KNOW how to lead? Can they connect with their workers and encourage and motivate them to work? i liked the video and it does pull you in. I think I would like to read the book. However, I cannot imagine people going around without pants. I always liked Scott. He said what he thought. No b.s. I wondered what happened to him. It’s nice to know he’s doing well. I’ll have to buy the book. Good luck with your book, Scott.